The Centre for Contemporary Art, Ujazdowski Castle, Warsaw. There was once a military hospital here; its history has inspired Monika Weiss’s art installation. There is something resembling a “memory room” in one of the spaces in the castle. When some people see the old syringes there and a rosary made from spent rifle shells, they mistake them for works of art. But among the artists showing at CCA, only Weiss has created work that refers to the castle’s wartime past. From March 12, in its cellars, we can view her installation entitled “Sustenazo.” . . . In Poland Monika Weiss attended the school of music and graduated from the Academy of Fine Arts. She left 15 years ago, and now lives and works in New York City, but exhibits her work around the world. In the early summer of 2009 Weiss returned to Warsaw for a three-month stay as part of the Artist In Residence program. 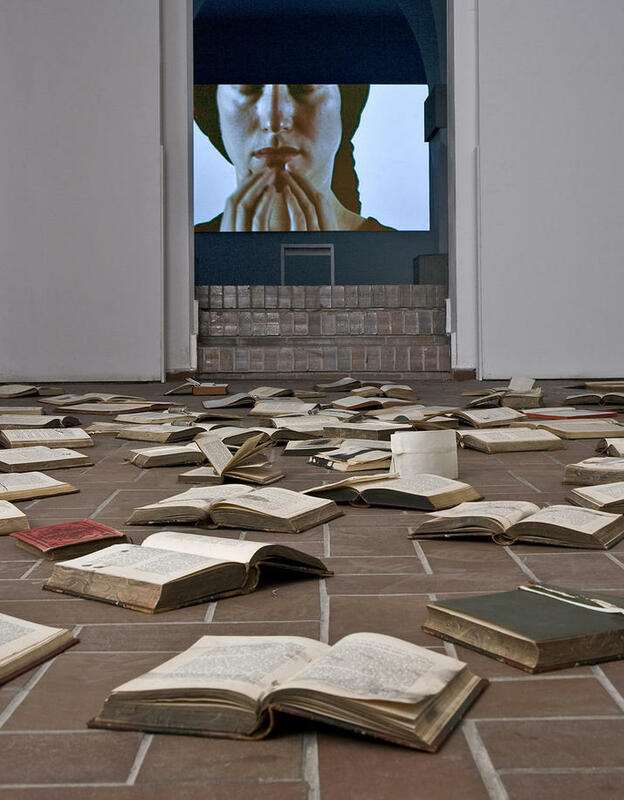 Weiss combines drawing, video, sound, and performance in her art. The documentation of her action in New York City in 2006 leaves a special impression. Near the destroyed World Trade Center people are lying on the ground, drawing—in the photographs they look like insects lying upside down. Drawing becomes their trace, a notation of both movement and time. 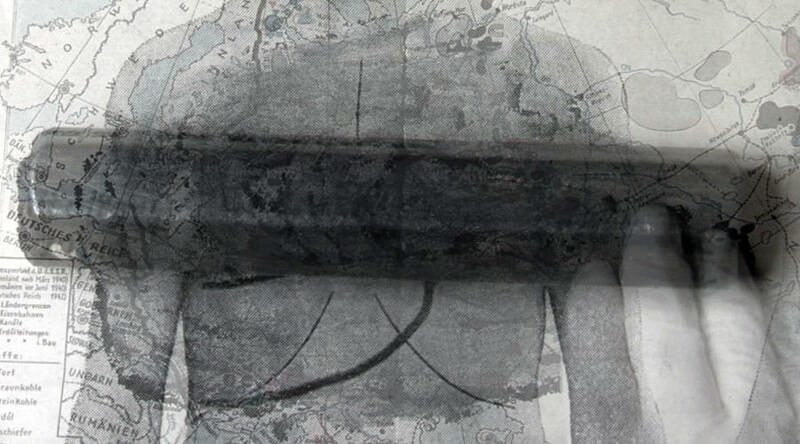 Drawing as trace—this is one of the recurring motifs in the work of this forty-six-year-old artist. “I am not a historian,” she says, “but sometimes I begin by researching documents, going through archives, and talking with scientists.” The history that interests her most is the marginal, the unimportant, what is considered peripheral to the events. “Sustenazo” speaks of what happened on August 6, 1944, when, on the sixth day of the Warsaw Uprising, the Germans ordered an immediate evacuation of the Ujazdowski Hospital. Weiss did more than go through the archives. She found living participants in the events and recorded their stories. She spoke of this during the press conference that was attended by several journalists, as well as a group of older people whom she had invited. “I wish,” says the artist, “that everyone would experience the work alone and for a long stretch of time. That’s why openings are the worst.” . . . The cellars are the only original part of the castle—the rest was destroyed and dismantled in the early 1950s. Then, after a few decades, there began a meticulous reconstruction of the historic building. We are walking through a long, dark corridor. At its end, from a vaulted space, we hear a recitation. “It’s Paul Celan. He is very important to me,” reveals the artist. “You were both here then?” I ask. The older people continue recounting their memories, and the artist gives interviews. 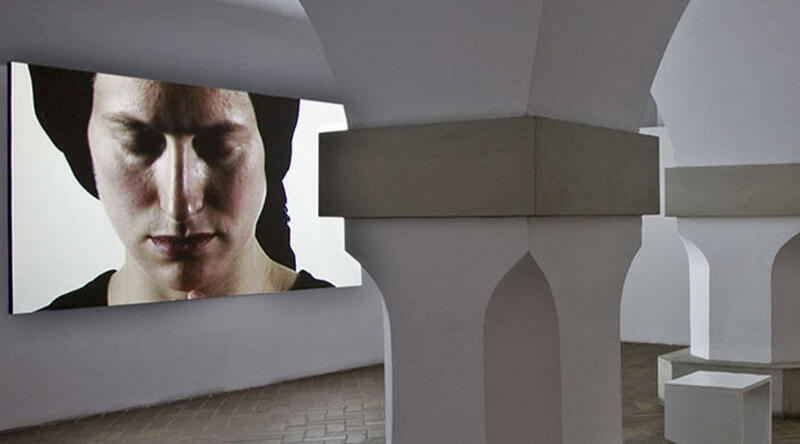 The voices in the exhibition overlap and alter, change into a murmur. . . I look intently at the documents in the video. 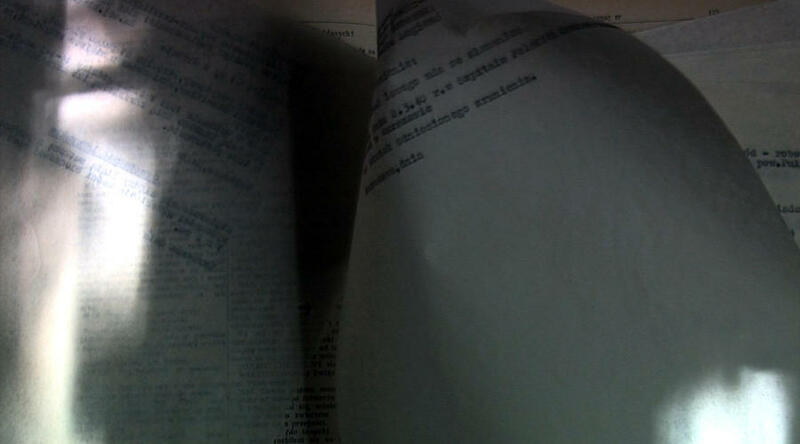 Images overlap; reflections of light run through the texts. I try to read names and dates but can’t. I talk to the artist about it. We enter the next gallery. Scattered about here are old medical textbooks, volumes of poetry, and a nurse’s handbag. In a black-and-white film we see a gymnast jumping in a double somersault. The walls are covered with drawings—pages that the artist has torn out of books by Goethe (printed in a beautiful schwabacher type). There is also a large photograph showing an elegant interior view as from “The World of Interiors.” This is Krystyna Janda’s bedroom. The artist adds: “When after many years the Gruszczyński villa was bought by Krystyna Janda, neighbors used to ask her if she was afraid to sleep in her bedroom. It was the most beautiful and quiet room, and that’s where the sick that were in the worst condition were placed. Many died there.” . . .
It’s hard not to agree with his statement. 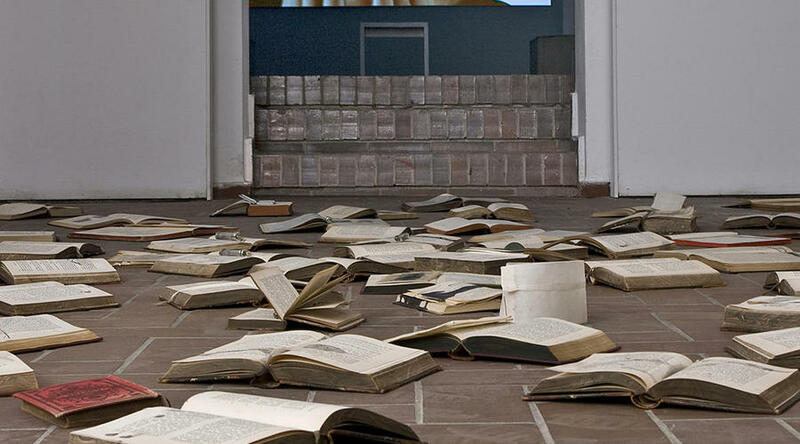 But I think about the fact that Monika Weiss titled her installation “Sustenazo,” a Greek word that means “lamenting together, in silence.” I find it important that there is someone who doesn’t try to teach us anything, but simply tells us about the helplessness of human language. 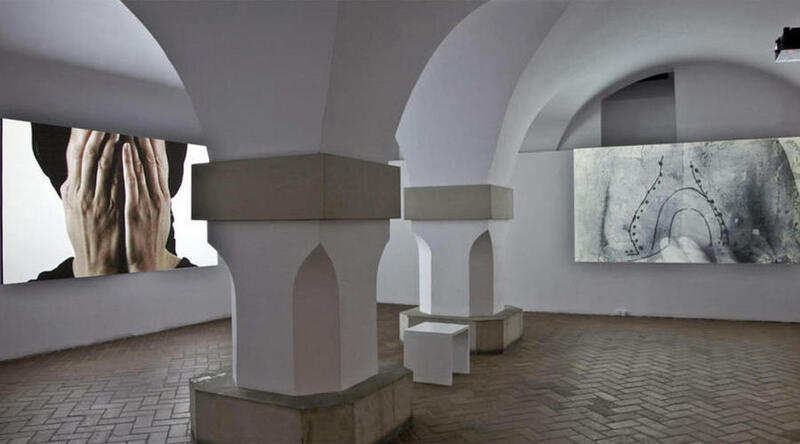 The exhibition “Monika Weiss: Sustenazo,” at the Centre for Contemporary Art, Ujazdowski Castle, Warsaw, is on view through May 3, 2010.